This lovely arbor was completed in less than five hours. 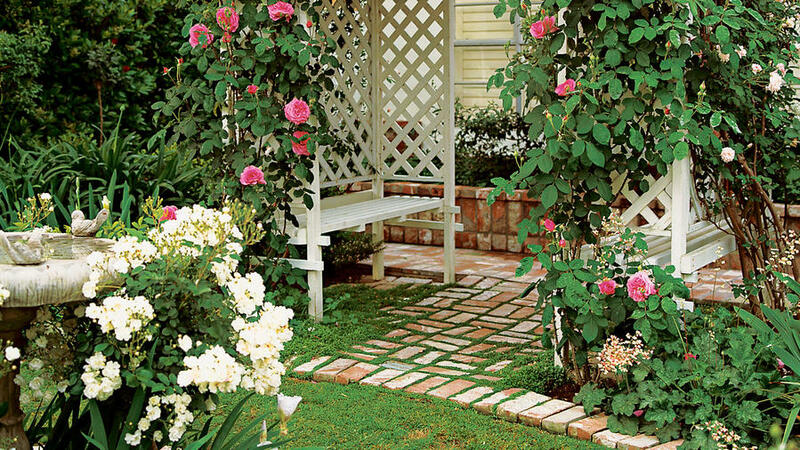 Covered with dainty rose blossoms, the arbor in Tom and Juliette Domenici’s garden in Huntington Beach, California, looks like it was custom-made. Actually, it was assembled from off-the-shelf pieces available at some home improvement centers. Tom completed the arbor in less than five hours. The project cost around $300. The arbor is formed by two ready-made wood arches spanned by 1-by-2s. Because Juliette wanted the arbor to support a ‘Cécile Brunner’ climbing rose, a fairly vigorous grower, Tom used 13 1-by-2s to connect the span. (Heavy, woody vines like wisteria would also require more substantial support.) For a lightweight annual vine, 7 1-by-2s would be sufficient. To discourage rot, the arbor rests on bricks to keep its wood base from touching the ground. Each arch section has cozy seating inside. At the rear of each, Tom attached a lattice panel to support the rose canes, provide a backrest, and enclose the seat. • 2 lattice caps cut to 50 in. 1. Place the two arches 4 feet apart, as shown, in the desired location. Unscrew and remove the seven existing crosspieces atop each arch. 2. For normal support, attach seven 1-by-2s to the arches with 1¼-inch screws, using the existing screw holes. For extra support, attach six additional 1-by-2s between the other seven. 3. Saw the lattice panel in half crosswise. To cover exposed edges, attach lattice caps with two 1¼-inch screws per cap. 4. Across the back of one arch, hold one of the capped lattice panels at the same level as the existing lattice panels, mark the corner edges with pencil, and set the panel aside. At each of the marked corners, attach an L bracket with four 1¼-inch screws. Slide the lattice panel into the L brackets and attach to the sides of the arch with eight 1¼-inch screws. Repeat for other arch. 5. Place seating planks on built-in crosspieces. 6. For extra support, attach one 2-by-4 horizontally to the back of each arch (just behind the seating plank) with four 2½-inch screws.